Definition:TDR stands for “Ticket Deposit Receipt”. 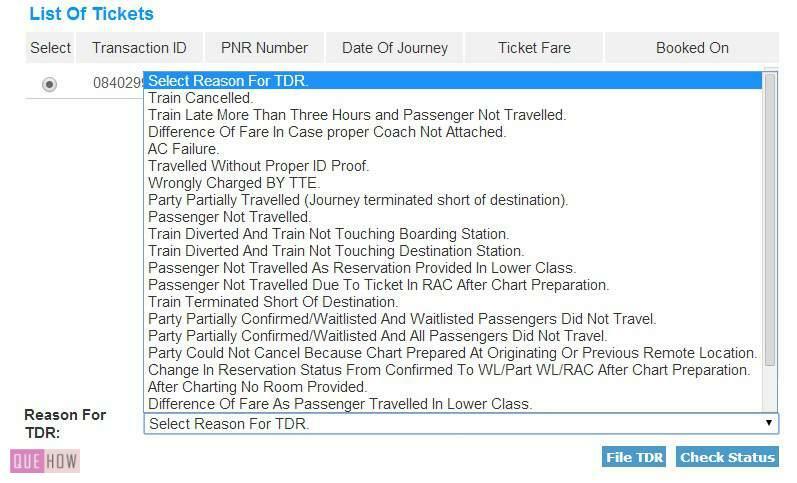 A TDR is filed for an e-ticket to claim the refund of money if the passenger didn’t travel due to any of the reasons. You need to file a TDR if the boarding on train is to be cancelled in case charting is done. TDR can only be filed for e-ticket not for the I-ticket (ticket delivered at your door step once booked online). 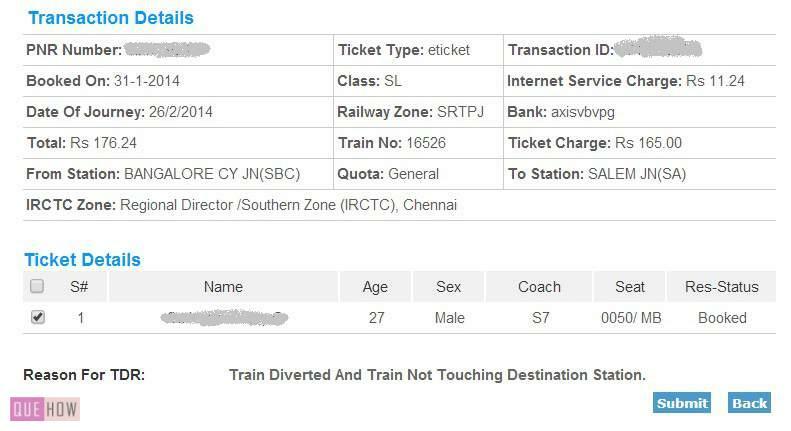 Step-1: You need to login to the official site of IRCTC (irctc.co.in) with the same account you booked your ticket. At the Home page of the site, expand the option form the left menu bar “My Transactions”. In My Transactions, select the option “File TDR”. Step-2:Now, inside File TDR window Select the Ticket you want to cancel. Step-3: In the “Reason for TDR” (Shown at the bottom of the window) select the reason for filing a TDR. Step-4 : Select an appropriate option and click on “File TDR”. After clicking on “File TDR”, a new “TDR Entry” page will appear. There you need to select the name of passenger for whom you want to file a TDR. Select the check box of the passenger and click on “Submit”. A TDR will be submitted and will be processed in the prescribed time duration.